The roof on your home should protect your home from weather and storms that constantly attempt to penetrate it. Once a problem occurs on your home’s roof and water makes it way past the outer barrier you may have all sorts of problems. Getting roof replacement in Howell Michigan can protect your home from the weather and storms but you’ll need to use a fully qualified roofing company in Howell Michigan and the best roofing contractor in Howell Michigan is Livingston Roof Pros. I’ll go over some of reasons why you need a qualified roofing contractor to replace your home’s roof in Howell Michigan in this article. There are many roofing companies in Howell Michigan that offer roofing services. 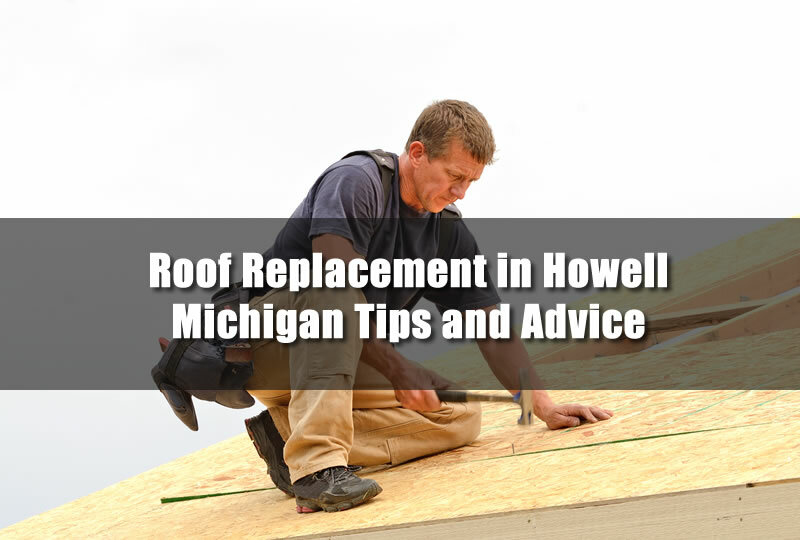 Most of them offer some sort of roof replacement in Howell Michigan. But using cut rate roofing contractors who are not qualified or not trustworthy not only puts your roof at risk but it also puts your home at risk as well. When your roof start leaking after a faulty roof install you can have all sorts of problems related to water damage. Damages can be stained or damaged cielings, walls, and floors but it can also damage items in the home. Items like televisions and other electronics that are located under a roof leak can short out from the leaking water. By using a low quality roof installer for your roof replacement in Howell Michigan you can be risking not just your money but also your home as well. Replacing your home’s roof can not only protect the home from storms and weather but it can also raise the value of your home. This is especially true if your home currently has older, less desirable style of shingles such as three tab shingles. Adding a new roof in Howell Michigan with more stylish asphalt shingles such as architectural shingles can raise the value of your home. It can also significantly increase the curb appeal of your home dramatically. If you plan on selling the home the manufacturers warranty may also pass through to the new owner which can help you sell later depending on the type of roofing materials used in the roof replacement in Howell Michigan. Talk with one of our roofing specialists today to learn more about the warranties on different roofing systems that are offered by Livingston Roof Pros. One of the biggest problems for most roofing companies in the Howell Michigan area is that they are not qualified or even licensed to work in Howell Michigan and surrounding areas. By using a fully qualified roofing contractor in Howell Michigan you can be sure the project will be done correctly and your home’s roof will perform as it should. By using roofing companies that are not qualified you may be risking the factory and manufacturer’s warranty of the roofing materials that are used. One of the traits of Livingston Roof Pros is that we’re always ready when you have a roofing problem. Whether it’s roof replacement in Howell Michigan or roof repair in Brighton Michigan, we’re constantly ready to help customers with their issues and concerns. We take customer service very seriously and we do everything we can to make sure they are completely satisfied with any of the roofing services that we offer here at Livingston Roof Pros. We have been part of this community for decades and will continue to provide the community of Howell Michigan and the surrounding areas quality roofing service at competitive pricing. We take customer service very seriously and we do everything we can to make sure they are completely satisfied with any of the roofing services that we offer here at Livingston Roof Pros. No matter what type of roofing materials or system you currently have installed on your home in Howell Michigan we can make sure that the work is completed correctly but qualified professionals. We service and maintain all sorts of roofing materials and we also offer free quotes on new roof installations in Howell Michigan. Give us a call today to get your free estimate for a new roof replacement in Howell Michigan today.